With Eastertide, Ascensiontide, Whitsuntide, and The Feast of Corpus Christi all in our rearview mirror, we begin the long Church season of Trinitytide, also known as the Ordinary Season. The church calendar began back in December with the Sundays in Advent. Christmastide was the 12 days of Christmas, then the Epiphany season leading up to the pre-Lent gesima Sundays, and then Lent. The entire year is marked by church time, with fluctuations in the number of Sundays in Epiphanytide and Trinitytide based on when Easter is celebrated. Easter Day is set with a lunar calendar formula and can range from as early as March 22, to as late as April 25. Trinitytide is a long season of orderly teaching about the Faith (which is why it is also called Ordinary Time). The Sundays are numbered as Sundays after Trinity. This year there are 23 Sundays between Trinity and when Advent begins a new Church year on November 30. One way to break up the long stretch of this green vestment season is that we can celebrate the Prayer Book Holy Days if they occur on Sunday. Today is one of those days. The Feast of St. Peter the Apostle is June 29, so we are celebrating that Feast today. Other special Feasts falling on a Sunday in Trinitytide this year include St. Bartholomew (August 24), Holy Cross (September 14), and St. Matthew (September 21). All Saints’ Day is always celebrated on the Sunday after November 1 (November 2 this year), and with the Bishop’s permission we also celebrate St. Michael and All Angels on the Sunday following September 29 (October 5 this year). If you are someone who is interested in how all this works, the information about finding feast days, and when Easter occurs, is found near the front of the 1928 Book of Common Prayer on pages l–lvii. Today is red for St. Peter, and next week into the green of Ordinary Time. One way that God is mightily at work at St. John’s is through the Healing Ministry. St. John’s has been blessed with members of the Order of St. Luke, the healing ministry of the Episcopal Church. Lead by Gerry and Sandy Dreslinski, they are most visible on the third Sunday of the month, when they offer prayers for healing at the baptismal font after Holy Communion. I know that I am deeply moved when I am bringing Communion down to those in the pew who are unable to ascend to the altar rail, and I see a large group of people praying for each other. God the Holy Ghost is wonderfully active through this ministry! Many praise reports are being shared of miraculous healing, the assurance of God’s presence in suffering, and the deepening of faith through this ministry. But God is not just active in healing on the third Sunday! The clergy, the Dreslinskis, and other members of the Order of St. Luke are available before and after all services to pray with you. On Wednesdays we have a Healing Communion Service at 12:15. Additionally, the Daughters of the King of the parish have a very active prayer ministry, and are willing to add your family and friends to their prayer intentions. Beginning in July we will be having a short testimony during announcements on the third Sunday by those whose lives have been touched by the healing ministry of the Church. It is a wonderful chance for us to rejoice in what God is doing, and show our gratitude to Him. I wish I could promise you that every prayer for healing will be answered just as we desire. But God is faithful in answering in ways that we may not expect, and perhaps in ways that are not the result we want. He has a plan. But we go to Him with the same faithfulness that says “We know God that you can do it”, while also saying, “Thy will, not mine, be done”. Last weekend we retired a parish register. Every parish church has a book, or books, for recording baptisms, confirmations, marriages, and burials. It is one way that the church keeps track of her members, and becomes a great historical resource as well. On June 14, I officiated at the wedding of Brian and Stephanie (Johnson) Lang. As with all marriages, it was entered into the parish register. 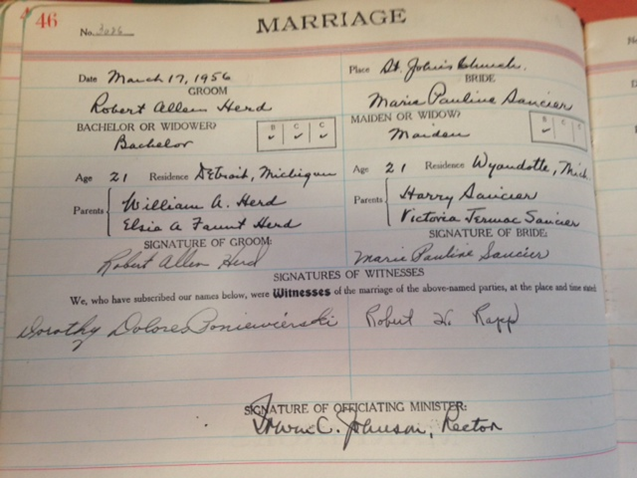 It was the last space in the book that began with a wedding on March 17, 1956 (Mr. Robert Allen Herd and Miss Marie Pauline Dancier). The officiant was The Rev’d. I. C. Johnson, rector of St. John’s from 1934 to 1962. That first wedding in the book is number 3026 in the history of St. John’s. The wedding last weekend was number 3421. That means in 58 years there have been 395 weddings at St. John’s for an average of nearly seven weddings a year. Since 1859 the parish has averaged 22 weddings a year, a number elevated from years like 1926 when 60 couples were married at St. John’s! 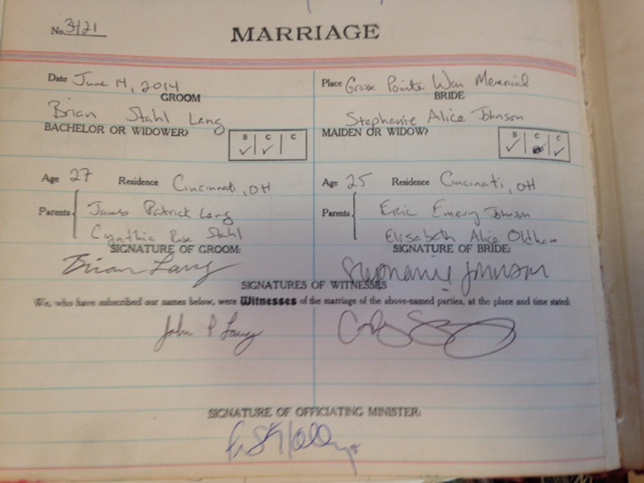 This register will now be put in storage in the office, and will be used to answer requests about family histories and inquiries for proof of marriage. Last week those who attend the 8:00 AM service had quite the adventure getting to St. John’s. 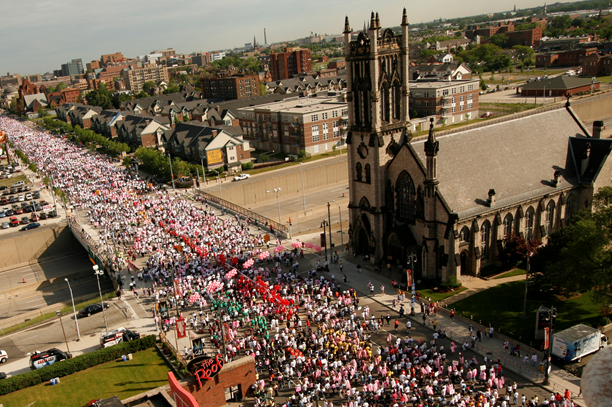 At the same hour over 40,000 members and guests of the Jehovah’s Witnesses were parking around our neighborhood and heading to Ford Field for their Regional Convention. The Jehovah’s Witnesses are perhaps best known by most people because they knock on the door of your home and try to convince you to join their group. Founded by Charles Taze Russell in the 19th century, he asserted that only he and his inner circle had a proper translation and interpretation of scripture (he neither read the ancient languages of the Bible to translate it, nor had any education in theology) and forbade the members of his group to read any information about the Bible not published by them. He and his group deny the Divinity of Christ, the Holy Ghost, and the Trinity. Our signboard became an opportunity to evangelize on Sunday. In addition to signs about Whitsunday (the Holy Ghost), I put up these signs a few days early to help teach the truth about God in Jesus Christ, and about the Holy Trinity. Belief in the Trinity is a basic biblical doctrine to be embraced by all Christians. As I mentioned during my announcements on Sunday, we should be praying for those who have become deceived by this heretical sect. But in addition to praying for their conversion, let us pray that we could have their boldness and zeal to make converts! They estimate they have to knock on 740 doors to get one person to attend their meetings. Armed with the Bible Truth, we might not be knocking, but should be actively sharing and inviting others into a relationship with Jesus with us at St. John’s. Whitsunday is another wonderful day because we witness once again that God is faithful to his promises. God in Jesus Christ promised his Apostles and disciples that he would send to them the Holy Ghost, the Comforter. He has promised that the Holy Ghost would lead them into all truth. And he promised that through the Holy Ghost we would be empowered to do the work of the ministry that he has set before us. God is faithful. And of course our responsibility is to be faithful as well. Whitsunday (also known as Pentecost) is an ACTION day. The Apostles and disciples on this day are receivers of God’s gift of the Holy Ghost, and they immediately go to work. The Holy Ghost gives them the gift of tongues so that they can witness to the people from the various nations who were in Jerusalem in their own languages. They get right to work proclaiming the good news that Jesus Christ is Lord, that he is risen from the dead, and that we have eternal life in his name. It is no different today. Although some may manifest the gift of tongues, there are other gifts (see the teaching notes on page 4) as well as such manifestations as miracles, healing, distinguishing of spirits, and prophecy (1 Corinthians 12:7–11). St. Paul reminds us that it is given as God wills, and more importantly it is given “for the common good” (1 Cor. 12:7). Here at St. John’s we must be challenged by the Holy Ghost to not just be “consumers of religion”. What is happening here is not about being served. We are EMPOWERED by God the Holy Ghost, and just as the disciples did on that day, we to are to get to work! Share the reason for the hope that is in us to our friends and neighbors, invite them to worship with us, and pray for them to the Father in Jesus’ name! Become involved in ministry through this parish and beyond. Seek ways to serve God in others. In the end, it isn’t about US, it is about HIM. We are to be transformed by grace and empowered by the Spirit. Imagine what that church looks like, and let’s become it! Today we have another one of those days that make St. John’s “special”. We are surrounded by the Motor City Hoedown! This is not the first time that we have had a concert in our parking lot. Many years ago there was a traveling summer concert series called the Snow Jam, which included a HUGE structure for snowboarding in August, covered with crushed dry ice. Other years the Warped Tour concert series also set up in our, and the neighboring, parking lots. 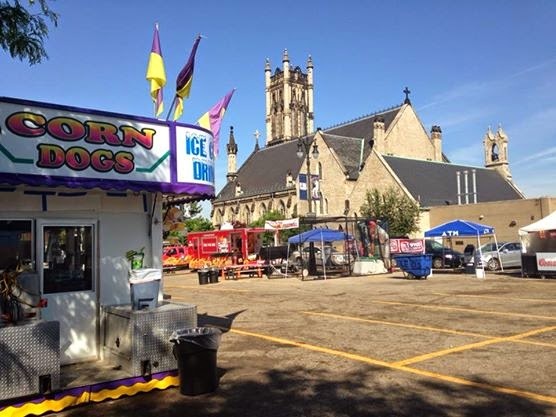 But the Hoedown is the only concert that has overlapped onto Sunday, and we are grateful to Olympia Entertainment for making both provision for parking for us in the morning, as well as scheduling these events to raise extra income for the Church. 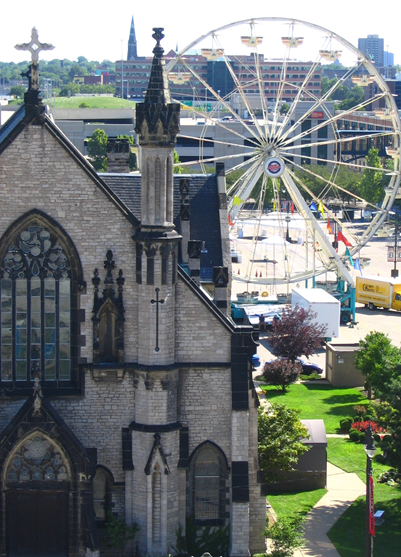 Other times the church lot has been used as a pre-concert festival, replete with a ferris wheel and urban beach volleyball area. This will be returning later this summer with the Jimmy Buffet concert, but disassembled in time for Sunday Services. Other times the lot has been used as an assembly area for various charitable walks and races. 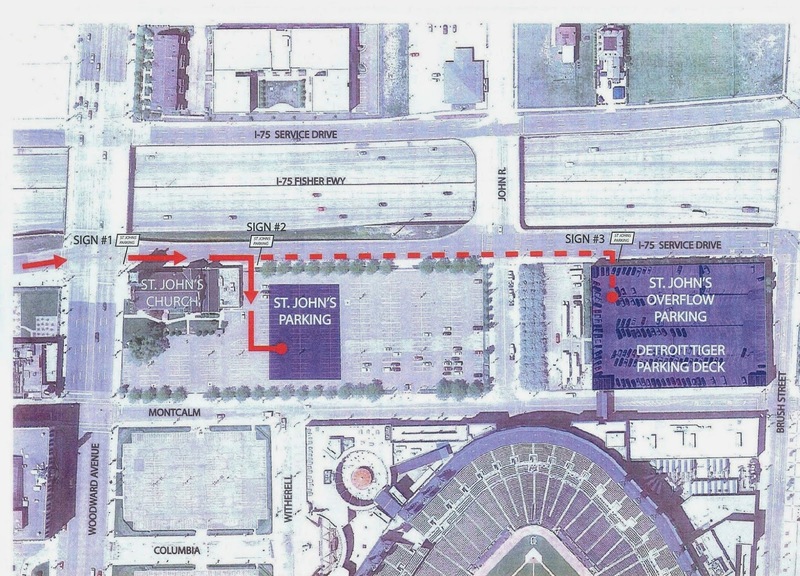 Add to this the regular Tigers, Lions, and in the future Red Wings, game parking and you realize that St. John’s really is in the middle of all the excitement of Downtown Detroit. Of course, the primary purpose is parking for our services, and for that we are most grateful to have the lot.